The leaves have already turned orange, yellow, red and brown here in DC meaning it’s the most celebration-packed time of year. There is Hispanic Heritage Month, Fall and Harvest celebrations, Day of the Dead, Thanksgiving, Passover, Christmas and New Years, just to mention some. I did not even include all of the year end office, school, neighborhood and friend get-togethers. Lately, I’m telling my boys how amazed I am at how fast the time passes. When I was in middle school like Juju, I remember feeling every hour of every day pass, as if churning ice cream by hand… so slow. Coming home from school was a long awaited haul, and getting to the weekend an eternity. As I got older though, time seemed to be marked by the weeks. By college the months seemed to run into each other, only to stop and catch their breath during school breaks. When I got married and moved to the US, I was so stunned by the change of seasons. It was their passing the baton from one to the other that seemed to mark my pace. Witnessing the seasons changing was new to me having come from Mexico City, where there seems to be one eternal season with a crazy rainy interruption. Well, the last few years I’ve barely been able to grasp what the marks of time are and can only feel it whirling on! I blink an eye and it’s summer. I blink again, and we seem to be speeding like mad to wrap up the year. I swear the entire year feels like what an hour used to feel like when I was Juju’s age. No surprise then, the faster the years seem to go, the more I want to celebrate anything and everything. Aside from sipping it neat, I love coming up with one new and fabulous cocktail every year to mark our holidays. It has become a trendy thing around here and now my friends expect it. So this year, this is the one. I was daring and bold and it paid off. I call it Spiced Up Pomegranate, Chile y Limón and it is a delight! And it’s very easy to make. You could even make it ahead of time, too. I start off with a flavored simple syrup. Many people seem baffled when they hear the term simple syrup. Mixologist jargon for sure, it sounds like something complex to prepare or something you get at a hard to find specialty store. But simple syrup is nothing more than sugar dissolved in water! And you can flavor it any way you want. For this cocktail, I flavor it with whole allspice berries, true cinnamon also known as canela, a whole clove, and the rind of a lemon. It makes for a simple syrup that is fragrant, citrusy, lightly spiced up, and has warm comforting tones from the canela. The more you let the simple syrup sit and become infused, the more the lemon rind will also absorb the simple syrup and become candied. Then it is a treat of a garnish to bite into as you sip your cocktail. Once you have the spiced up simple syrup, you blend it with the lively and tart pomegranate juice, an entire fresh and grassy jalapeño – do not remove the seeds please – and fresh squeezed lemon juice. 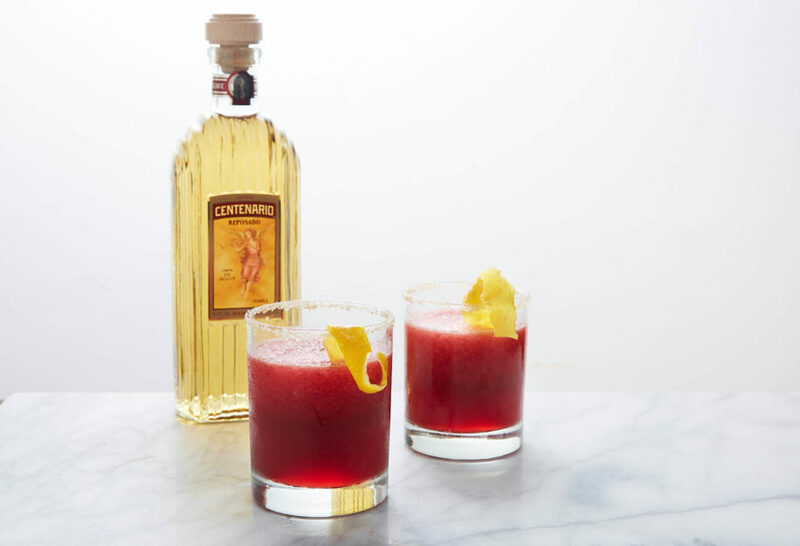 For the tequila, I use Gran Centenario Reposado, which is mildly fruity and teasingly sweet. It has a woody fragrance, and you can taste an echo of almond and vanilla in it that compliments the syrup and the pomegranate. They have a page on Facebook and Instagram, if you want to know more about them. 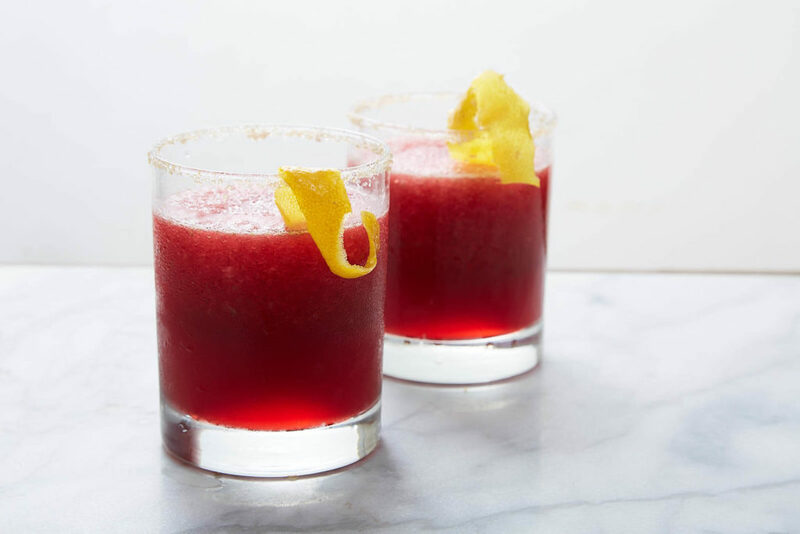 This Spiced Up Pomegranate, Chile y Limón cocktail is so multilayered and irresistible it’s never an afterthought. You want to savor every single sip. It will claim its delicious place at center stage of your celebration. In a small saucepan, combine the granulated sugar, water, allspice berries, cinnamon, whole clove and lemon rind. Set over medium heat and let the sugar dissolve, stirring occasionally for 3 to 4 minutes, until you cannot see the sugar granules anymore. Remove from the heat. Let it steep anywhere from 30 minutes to 12 hours. When ready to use, strain the spiced syrup into a small bowl or measuring cup. Reserve the lemon peel and cut it into 6 pieces. In the jar of a blender, add the tequila, pomegranate juice, lemon juice, jalapeño and strained spiced syrup. Puree until completely smooth. Add the ice and puree again. On a small plate, combine the turbinado sugar, salt and ground cinnamon. Rub the top of 6 glasses with a quarter lemon or water and rim with the sugar mixture. Fill each glass with the pomegranate drink, garnish each with one piece of the sweetened lemon peel, and serve! Hi Pati, thank you for the curing the molcajete tip. Just wondering….where are you going for season 8? We are going to feature the state of Sinaloa. I can’t wait! We so enjoy your travels, cooking and family adventures on your amazing TV show. Big congratulations on your well deserved James Beard award. Quick question please – How do I authentically season a new Molcajete? (A quick internet search included pressure hosing the Molcajete for 10 minutes at a local carwash and 14 hours of grinding raw rice in the bowl). Oh thank you so much, Maria! Here’s some more information on molcajetes: https://patijinich.com/molcajete/ There are so many takes on how to cure a new molcajete, but I always like to take both rice and garlic to season and prep my molcajete. Love your show and recipes! I live in southern Colorado and we have a very strong Hispanic influence here. Mexican food is very popular, but it has evolved to be slightly different than the food I have experienced from Mexico. Green chilies are king here and in the fall everyone is roasting chilies! They have huge rotating drums with gas flames underneath to roast them, and they can do several bushels at a time. The chilies are used for many things, but green chilie sauce is the main dish they are used for. We have green chilie competitions and festivals. Thanks again for your show and recipes! Oh that sounds like so much, Joan! I hope to make it to one of the chile festivals one day…enjoy all of the delicious chiles. Well, my tastes are more simple. Try this: tequila blanca & pomegranate juice (in whatever proportions suit you) plus a squeeze of lime. Muy rico. P.S. If your travels ever take you to San Francisco, contact me at rwigen@comcast.net and I can clue you in to the Mexican food scene here. It has become quite sophisticated. That sounds yum too, Fritz! I hope to come to San Francisco soon.